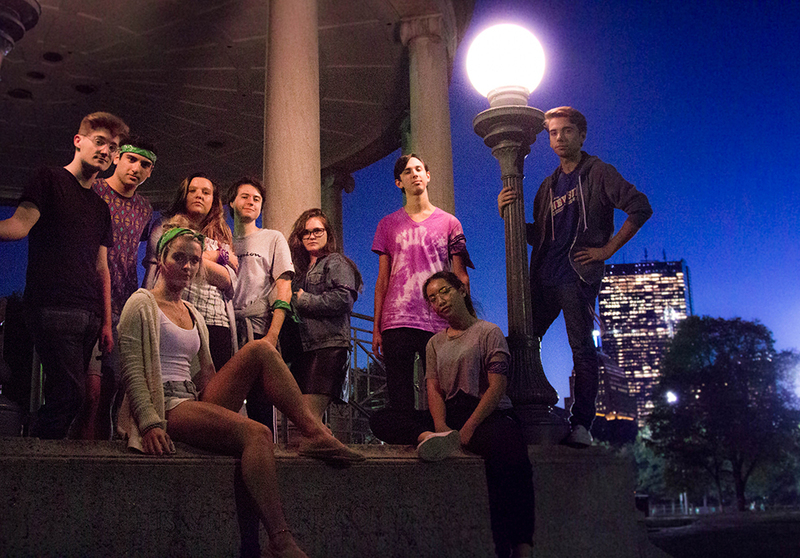 Members of season two of Survivor Boston on Boston Common. Survivor Boston is not your typical reality show. Instead of competing with complete strangers, you contend with the person two rows in front of you in your film lecture. Instead of tackling physical challenges in a tropical jungle or a sandy beach, you play capture the flag on the Boston Common. Alliances are made in common rooms and communal bathrooms. Sophomore visual and media arts majors Jacob Falberg and Charlie Welling, two self-proclaimed Survivor super fans, have given the hit reality franchise an Emerson twist with their creation of Survivor Boston. The first four episodes are available on the show’s YouTube channel, and season two is currently being filmed. The 18 students competing in Survivor Boston face off in weekly challenges that test their physical and mental endurance, and the losing team is forced to eliminate one team member at a “tribal council” session. Contestants are not only competing for the glory that comes with winning the competition, but also for a cash prize of $100. But because the show forgoes remote islands for a college campus, contestants deal with an awkward social paradigm. The idea for the show came to Falberg and Welling during one of Survivor’s hiatuses. Falberg and Welling set to work and raced to prepare the show in time to have at least half of the spring 2017 semester devoted to filming. Falberg and Welling managed to produce several episodes of Survivor Boston without the financial or technical support of a campus organization. The first episode of Survivor Boston: The Freedom Trail, which was uploaded to YouTube at the end of August, has over 1,600 views. Three more episodes of the season so far are available online. Thanks to the popularity of the series, Falberg and Welling were able to hold open casting calls to pick their contestants this season, instead of asking their friends to compete. After selecting their cast, the 18 competitors were split into two teams, or “tribes,” like on the original program. Emily Kidd, a sophomore business of creative enterprises major, is a contestant on season two of Survivor Boston. Kidd is a member of the Makwa tribe, which means bear in the Algonquian language. She said she was racked with nerves on the first day of filming. Bailey Dutton, a sophomore comedic arts major, is a member of the Pijaki tribe, which means buffalo. A self-identified “information person,” Dutton said he has yet to “string a web of lies” in order to advance in the game, but he’s built up a strong reserve of information he can use in the competitions. Although the season just started, Dutton said he has already learned a lot about his fellow Emerson students through the competition.